Wright shows - convincingly - how the comprehensi veview of Paul, Romans, justification, Jesus, and the Christian life and mission that he has helped articulate embraces 'both the truths the Reformerswere eager to set forth and also the truthswhich, in their eagerness, they sidelined. Eavesdropping on this conversation will help readers who are new to Wright get into the main themes ofhis work and the important conversation ofwhich it is a part. And it will giveWright's critics a clearer sense than ever ofwhat theyare rejectingwhen theycling to their cherished old wineskins ofconventional thought." 1 What's All This About, and Why Does It Matter? Wright N. T. - Justification - God's Plan and Paul's Vision - What's All This About, and Why Does It Matter? IMAGINE A FRIEND COMING to stay who, through some accident ofeducation, had never been told that the earth goes round the sun. As part ofa happy evening's conversation, you take it uponyourself to explain how the planetary system works. Yes, from wherewe stand it does ofcourse seem that the sun circles around us. But this is merely the effect ofourperspective. All thatwe now knowofastronomy confirms that the earth on which we live, in companywith a few other similar planets, is in fact revolving around the sun. Youget out books, charts and diagrams, and even rearrange objects on the coffee table to make thepoint.Your friend alternatesbetween incredulity, fascination, momentary alarm and puzzlement. Eventuallyyou smile, have another drinkand head for bed. Широко обсуждаемая и дискутируемая (Дж. Пайпер, Д. Карсон) работа Райта относительно оправдания: одного из центральных положений христианской веры. 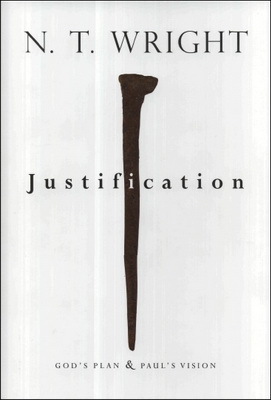 WHEN I HEARD ABOUT John Piper's book The Future of Justification: A Response to N T. Wright, I was torn between two reflections. On the one hand, as they say, the actor doesn't mind whether he's playing the hero or the villain as long as it's his name on the boardoutside the theater. On theo therhand, there is adanger that if people type cast you as the villain the image may stick and you won't get any other parts. So, despite my initial reluctance to get drawn into the details of debate when I am really far too busy with other things, I eventually decided that an initial responsewas called for.